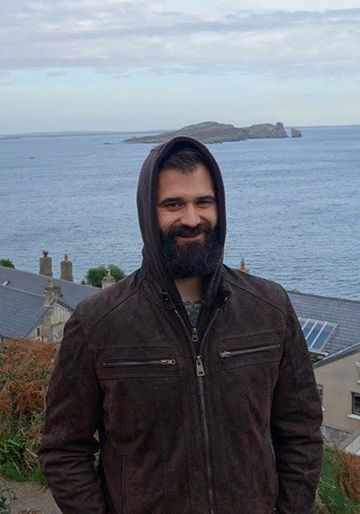 Justin's research at the University of Virginia focuses on the archaeology of the Byzantine Empire, monastic landscapes, ceramic use in rituals of authority and power, and archaeological survey methods. Justin also retains an interest in the material culture of Ottoman Cyprus and Greece, particularly the archaeology of coffee and tobacco consumption and their accompanying ceramics (e.g. Kütahya ware, porcelains, and pipes). Before joining UVA in 2016, Justin graduated from East Carolina University with an MA in anthropology. His master's thesis at ECU, entitled The Power of Porcelain: Authority and Landscape in Early Modern Cyprus, explored the distribution of porcelain fragments in rural Cyprus, how these artifacts may be used as an indicator of authority on the rural archaeological landscape, and who held this authority. For his undergraduate studies, Justin graduated from the University of Wisconsin–Oshkosh with a bachelor's degree in anthropology and history. Justin has participated on archaeological field projects in Jordan, Romania, North and South Dakota, and Wisconsin.